2 Nights accommodation at Las Vegas. Chinese Theatre, Rodeo Drive and Hollywood Sign. Orientation Tour, Fremont Street Light Show. Golden Gate Bridge, Ghirardelli Square, Fisherman’s Wharf - Pier 39. Monument, the World War II Memorial, Lincoln Memorial, Jefferson Memorial, National Air and Space Museum. Broadway, Times Square & United Nations Building. •	Optional Tours are subject to a minimum participation of 10 Full Paying Adults. •	Optional Prices are subject to change. •	Reservations and payment for optional tours will be governed by the Terms and Conditions of the offers as selected by you. •	All prices are subject to availability. Hotel surcharges (if applicable) during high / festive season, trade fairs, exhibitions, conventions, special events etc (to be paid extra per person). Porterage at hotels, apartments, airports and seaports, laundry, wines, mineral water, telephone charges, insurance and all items of personal nature, also food and drinks not forming part of the group menus. •	Welcome to your “ American Sojourn ” tour! •	check in (check-in after 1400 hrs). •	The rest of the day is free to explore this beautiful and exciting city on your own. Overnight at Los Angeles. •	Driving past Beverly Hills, the famous Sunset Boulevard, Mann’s Chinese Theatre, Rodeo Drive and the well known ‘HOLLYWOOD’ sign. •	Later, drive to Las Vegas. •	On arrival, proceed on an orientation tour. Enjoy the sights and sounds of Las Vegas with the towering Stratosphere Tower rising 1,149 feet into the air and the Downtown Glitter Gulch where Las Vegas began. Enjoy a wonderful show in Las Vegas – the Fremont Street Light Show. •	A night of entertainment in Las Vegas is a lifetime experience. •	Overnight at Las Vegas. •	The day is free to explore this exciting city on your own. •	Or we recommend that you treat yourself and your family to optional excursions of the Grand Canyon. •	Grand Canyon is a natural wonder of the world - where instead of ‘Grand’, more appropriate adjectives are ‘Glorious’, ‘Exalted’, ‘Divinely Inspired’. One glimpse of its mighty majesty is all it takes to comprehend the name. •	Today we depart from Las Vegas to San Francisco. •	Rest of the day is at leisure and you can explore this city on your own. •	Overnight at San Francisco. •	Today proceed on a guided sightseeing tour with a walk on Lombard Street, the most crooked street in U.S.A. Then drive past the Civic Centre. Stop for a photograph at the Twin Peaks from where you can view the Golden Gate Bridge, painted an ‘International Orange’. •	Later, drive to San Francisco’s most popular destination, the Fisherman’s Wharf through Ghirardelli Square known for its historic waterfront and considered the city’s most popular tourist destination with delicious seafood, spectacular sights and unique shopping. •	Spend a dollar or two at Pier 39, a festival marketplace with more than 110 stores and numerous fun filled attractions. •	You also have some free time to walk to the bay where you have the option of enjoying a cruise on San Francisco’s famous bay. •	Sail along San Francisco’s breathtaking waterfront onboard the Bay Cruise, under the majestic Golden Gate Bridge, and around the notorious Alcatraz Island. 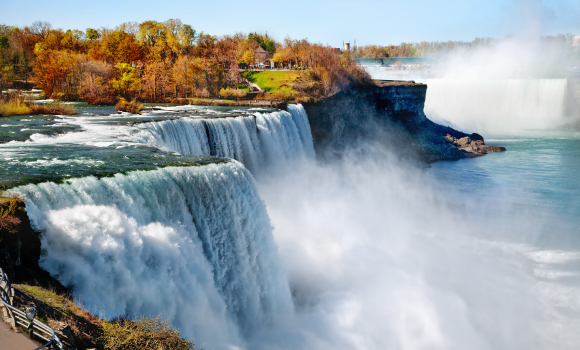 •	This morning, take a flight ( on your own arrangements ) to Buffalo from where you will proceed to Niagara Falls. •	The power of mother nature overwhelms the senses as you marvel at one of the world’s most incredible natural spectacles. •	A panoramic night view of the spectacularly lit Niagara Falls awaits you. •	Today, discover the beauty of the legendary whirlpool and rapids as you cruise past the base of the falls on the Maid of the Mist. NOTE: (Due to weather conditions, the Maid of the Mist operates from the last week of May. The View Mobile Tram ride will be provided instead to all tours arriving Niagara Falls prior to the last week of May). •	Continue onto Hershey, Get ready for a fun-filled morning with a visit Hershey’s Chocolate World for a chocolate tour! •	The tour begins in a tropical rainforest, where cocoa beans grow and are harvested. •	Then, follow their journey across the ocean to America and their delivery to Hershey, Pennsylvania. The cocoa beans continue through a simulated Hershey’s chocolate factory, where you’ll see, feel, smell and hear the delicious transformation from bean to milk chocolate. •	This morning, enjoy a guided sightseeing tour of Washington D.C.
•	Your first stop will be Capitol Hill (photo stop). Then drive on through Pennsylvania Avenue to Lafayette Park for a view of the White House (photo stop). •	Make stops at the Washington Monument, the World War II Memorial - a monument to the spirit, sacrifice, and commitment of the American people, the Lincoln Memorial and the Jefferson Memorial. •	Next, visit the National Air and Space Museum at the Smithsonian Institution, the world’s largest museum complex. •	Overnight at Washington D.C.
•	Today, proceed to New York. •	Catch glimpses of the ‘Big Apple’ on your illumination tour this evening, driving past spectacularly lit landmarks of New York – it’s magnificent!! •	Spend some free time at Times Square. •	Overnight at New Jersey. •	Begin your day with a visit to the Statue of Liberty, at Liberty Island. 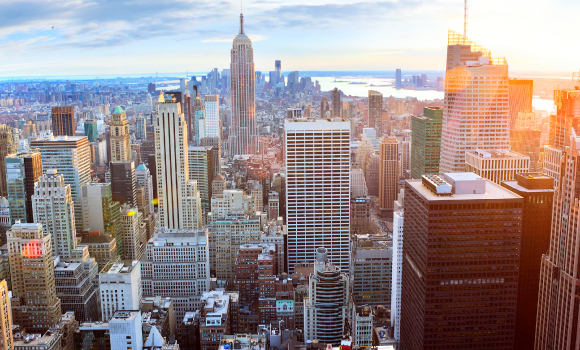 •	Later, proceed for a guided orientation tour of the ‘city that never sleeps’, driving past some of New York’s iconic landmarks like Wall Street, the New York Stock Exchange, World Trade Centre site (Ground Zero), Brooklyn Bridge, Broadway, United Nations Building. •	Good times need never end! As you get ready for the airport and your flight back home (on your own arrangements). •	Relive the high points of your “American Sojourn – Summer 2019” tour. Passengers have to book their flights as per the group flight timings; else they have to make their own arrangements to the designated start / continuation point of the days itinerary. On days when certain attractions, sights, monuments, museums etc. are closed, the Tour Manager reserves the right to amend the itinerary / cancel the visit. The tour price mentioned is applicable provided there are 30 full paying adults travelling on the tour departure. If the mentioned group size is not met passengers will travel on FIT basis. In such a case, FIT supplement will apply and travel arrangements may change or passengers may be given an option to travel on alternate dates with prevailing surcharges. Services of Tour Manager will not be provided if the group size on a particular departure is below 30 full paying adults.